The Remittances Africa Conference & Exhibition 2019 held in London on March. March 21-22 brought together key players of the remittance industry around the theme "Enhancing Financial Access through Partnership, for Growth and African Development". This conference opened discussions about important topics influencing the money transfer industry in Africa, such as the impact of diaspora investments, African market trends, the cost of money transfer operations as well as the future of the banking industry. Wari represented by its CEO, Mr Kabirou Mbodje, participated to the panel about the money transfer market in Africa, along with Dr Gabriel Negatu from AfDB, Valentine Obi from eTranzact, and Onyekachi Wambu from AFFORD. 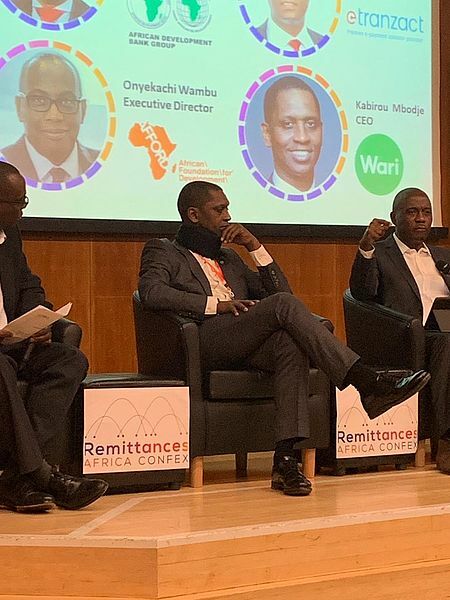 Remittances Africa Confex 2019 offered the opportunity to introduce remittance operators and strengthen relationships between industry experts, to share experiences and innovations of the financial and fintech industries, for the development of the African continent. Here is the official website: http://www.remittancesafrica.com/.